Provide comfort for the family of Ernest Bargmeyer with a meaningful gesture of sympathy. Ophthalmology at Baylor University in Houston, Texas in 1966 he moved here to Missoula where he loved hunting, skiing, flying and working as a eye surgeon. 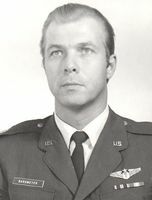 He later returned to active duty and served at Davis Monthan Air Force Base in Tucson, Arizona as a Flight Surgeon. Ernie retired as a Colonel from the US Air Force. After retirement from the Air Force he went to work in Tucson, Arizona at Eye Glass World he continued working until he was 75. Ernie loved to work and loved his patients. were entertaining friends and family at the cabin on Flathead Lake. Ernie is preceded in death by his Father Ernest Bargmeyer and his Mother Sophie. He is survived by his brother Robert Bargmeyer who lives in Dayton,Ohio, three sons and a daughter. Brad of Missoula, Randy of Missoula, Alex of Portland, Oregon and Brock of Belgrade, Montana. Three grandchildren, numerous cousins and other family members. And the family’s faithful dog Spike. Graveside services with military honors will be held Friday April 5, 2019 at the Western Montana State Veterans Cemetery at 2PM. A Celebration of life will follow at the home of his daughter and son in law at 124 Fairway Drive. Ernie will be greatly missed by all that knew him. To send flowers in memory of Ernest M. "Ernie" Bargmeyer, please visit our Heartfelt Sympathies Store. A Celebration of life will follow at the home of his daughter and son in law at 124 Fairway Drive.